Eleven-year-old Reynie Muldoon has lived at an orphanage as long as he can remember. He has always found it difficult to fit in with the other children because he is extremely intelligent; they make fun of his vocabulary and the things he says in class. His only friend there is his beloved tutor, a kind woman who, one day during breakfast, points out an ad in a newspaper inviting children to take a test to be selected for "special opportunities." Reynie finds the test, unlike the others he has taken in school, to be a true challenge. When he, along with several other talented children, is selected from among the hundreds of others who took the test, he embarks on an adventure the likes of which he has never imagined. 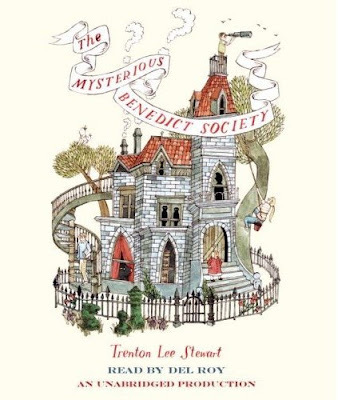 First the children are taken to a very strange old house to meet Mr. Benedict, the man behind the test. There, they learn of a danger that is menacing the entire country, and they find out that, in their unique position as highly intelligent, talented, resourceful children, they are the only ones who have a hope - a slim hope, but a hope - of stopping it. When they agree to try, they are taken to a very strange school located on an island (I was envisioning Alcatraz, although it is connected to the mainland by a guarded bridge). The children must infiltrate the school and manage to ferret out its secrets in order to foil the villain's dastardly schemes. I listened to this book on audio, and I have to say I am not a huge fan of Del Roy - his voice has this dropping intonation at the end of sentences that starts to bug me after a while, but that is probably just me. Other readers are better at differentiating characters' voices (Nathanial Parker, who reads the Artemis Fowl books, is exceptionally skilled at that - and of course Jim Dale is the king! ), but I found myself confused at times about which character was speaking. The plot had very exciting moments, but also times when the pacing was a bit sluggish. After a very detailed description of the tests and problems they had to solve in order to be chosen to be on the team, I was a bit disappointed that, once at the school, the children seemed to flounder around with very little direction. At the same time, it was fun to watch the characters battle their own weaknesses and learn to fight together, as a team, despite personality conflicts. The second half of the book took off, and the tension grew to a very nicely action-packed climax. One must seriously suspend disbelief to accept a few major plot developments, but it was an intriguing and memorable story that should appeal to many young readers. I bought this book last year because of a great title and wonderful book cover. At the time, I'd never heard of it but since have read some good reviews. I really need to get to it. It was totally the cover and the title that got me, too, Framed. I also love sinister/strange school stories, for some reason. I'll be interested to hear what you think of it!